hurrah! it's thrifty thursday, except this week i haven't had a chance to go thrifting due to spring break (gasp, shock, horror)...i know it's complete crappity crap, ("what, just like your cooking Tif?" i hear you shout, oh well done, you all go to the top of the class for getting that right). but do not fear for me or my sanity dear readers, if there is a will there is a way. if i can't get out to seek a second hand treasure or two then the next best thing is on the web...("ah ha, genius! "...why thank you). of course technically does ebay and craigslist count as thrifting? i'm not sure where i stand on this hotly debated topic but for the sake of my thrifty thursday slots, anything 'loved and used' in a former lifetime is okay with me (so i am guessing that could include rescued furry friends and all sorts, maybe a wee goatie named gertie...how wonderful). so using the buddy system, always important when going to meet strangers selling their wares on craigslist, i set off on tuesday with our #2 and her razor sharp wit, by my side. i always take her with me for several reasons, mainly because she is a 'top notch' navigator and has no qualms about shouting at her mother (quite gleefully i might add) "not there, i said there...when are you going to get your bi-focals" or perhaps, "let me carry that for you, is it your stroke arm again?" (due to a shoulder/arm injury i received whilst building the coop...all for the love of my chickens). but for the sake of a herman miller fiberglass chair (not original legs i might add) at a bargain basement price i was willing to take a risk, after all it was the perfect sewing height for Miss Ethel and also my complaining back and shoulder/arm issue. i'm not even going to go into the conversation that went on in the vehicle as we turned down dirt lane after dirt lane to find the little chair in an abandoned setting with a rather 'interesting' owner...even without our #2's suspicious mind, my little heart was racing. I have relatives working at Herman Miller. 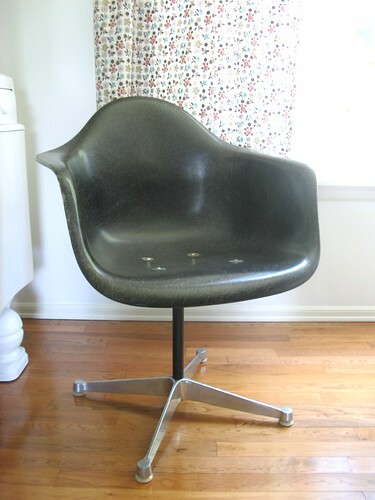 Alas, I do not own a Herman Miller fiberglass chair, but I think we had a bunch in our dining room when we were youths. No idea where those went. I love your chair and shudder at the thought of driving down those dirt lanes to godknowswhere. I have just stumbled onto your blog and I am completely charmed. We are just now in the design phase of mission chicken coop and hoping to have hens soon. I am also absolutely devastated that your Nellie skirt wont fit my middle, heartbreak indeed. P.S. I recently had to let go of my airstream, couldn't fit it into the backyard. Do you use one for a studio? I love your writing and think you could write a hilarious little book. :) I'd love it!